It has long been apparent that the crop of stallions that began their stud career in 2005 is a very good one. It’s members include Medaglia d'Oro (TrueNicks,SRO), Tapit (TrueNicks,SRO), Speightstown (TrueNicks,SRO), Candy Ride (ARG) (TrueNicks,SRO), and Lion Heart (TrueNicks) (exported to Turkey, but actually the leader of the group by 2010 earnings). The most recent weekend saw one of that group, Speightstown, underline his standing among North America’s young sires when two of his sons, Jersey Town and Haynesfield, fought out the finish of the Cigar Mile (gr. I, video below). The narrow victory of Jersey Town took Speightstown’s record with his first three crops to 19 stakes winners, eight graded, and four grade I. With those impressive statistics—which sparked a stud fee rise to $50,000 for the sire this year—it’s worth a quick review of how Speightstown is working at stud. The champion sprinter is by Gone West out of a Storm Cat mare, so bred on the same Gone West/Northern Dancer cross as Elusive Quality (TrueNicks,SRO), Grand Slam (TrueNicks,SRO), Zafonic and Zamindar. With that pedigree it’s no surprise that he’s been crossed over a lot of Northern Dancer line mares, nor is it surprising that the cross has enjoyed more than it’s fair share of success. He’s sired four stakes winners from 46 starters out of mares by sons or grandsons of Northern Dancer, and eight in total from Northern Dancer line mares, the cross accounting for three of his grade I winners. JERSEY TOWN (TrueNicks A++) is out of the very talented Jersey Girl, a multiple grade I-winning daughter of Belong to Me (TrueNicks,SRO), and so is one of those out of a Northern Dancer line mare. Belong to Me is by Danzig, out of a mare by Exclusive Quality, so is a reverse Northern Dancer/Raise a Native cross to Speightstown. Inbreeding to Northern Dancer/Raise a Native and Raise a Native/Northern Dancer crosses is one of the most familiar in current North American pedigrees, and it’s no surprise to see it working for Speightstown. HAYNESFIELD (TrueNicks B) became a millionaire with Saturday’s effort, and also boasts a grade I win over Blame in the Jockey Club Gold Cup. He is out of a mare by Tejabo, a son of Deputy Minister. Deputy Minister actually has some similarities with Belong to Me, as he is a Northern Dancer line horse, going back to a mare very closely related to Exclusive Native, the broodmare sire of Belong to Me. Haynsefield is one of three stakes winners for Speightstown out of a Deputy Minister line mare—the other two are FRENCH DIP (TrueNicks A++, out of a French Deputy mare) and MULLINS BEACH (TrueNicks A, out of a Silver Deputy mare, so inbred to Mr. Prospector)—and his grade I-placed two-year-old Wine Police is bred on the same cross. LORD SHANAKILL (TrueNicks B) is a group I-winning miler in Europe. He has a turf-oriented pedigree, as his dam is by Theatrical (by Nureyev), so again Northern Dancer, and out of a mare by Blushing Groom. MONA DE MOMMA (TrueNicks A++), who won the Humana Distaff Handicap (gr. I) this year, is out of a mare by Linkage (by Hoist the Flag). There are three stakes winners from only 12 starters by Gone West and his sons out of Linkage mares, also including grade I winner Link River. Of course we also shouldn’t overlook that Mona de Momma’s dam is a half sister to Mr. Greeley (TrueNicks,SRO), the late son of Speightstown’s sire Gone West. The granddam is a reverse Bold Ruler/Native Dancer cross to Gone West. Munnings (TrueNicks) (TrueNicks B+), who retires to stud this year, was a three-time grade II winner, and was also six times grade I-placed. He is out of a mare by Holy Bull (TrueNicks,SRO), and it is interesting to note that while the cross of Holy Bull with Mr. Prospector line mares has been very disappointing, Mr. Prospector line stallions have a good strike rate (seven stakes winners from 94 starters) with Holy Bull mares. BRIDGETOWN (TrueNicks A++) won the Summer Stakes (gr. III) and was second in the Breeders’ Cup Juvenile Turf (gr. II) at two, and shortened up to take two sprints stakes this year, setting a new course record for 5½ furlongs at Monmouth Park. His pedigree is a rather interesting one, as the dam is by a son of Storm Cat (Tabasco Cat) out of a mare by Alydar (by Raise a Native, also sire of Mr. Prospector, and bred on very similar lines to that horse). Thus the sire and dam are reverse Raise a Native/Storm Cat crosses, with the Raise a Native through genetic relatives. GEMSWICK PARK (TrueNicks C+), who took the Old Hat Stakes (gr. III) and was also grade I-placed, is out of a mare by Relaunch. Relaunch also appears in the second dam of Mullins Beach (above), and Relaunch’s sire, In Reality, is also responsible for Valid Appeal, sire of the second dam of Jersey Town. With Gemswick Park it is also interesting that her second dam is by Chief’s Crown, a parallel Northern Dancer/Secretariat cross to Storm Cat, the broodmare sire of Speightstown. DESPITE THE ODDS (TrueNicks A) earned graded honors in last year’s Hill Prince Stakes (gr. III). He is out of a mare by Cozzene, a horse who also figures as the broodmare sire of Gone West grade I winner Zaftig. The second dam is by Vice Regent, who of course is also sire of Deputy Minister, a horse who we’ve mentioned above. ROSE CATHERINE (TrueNicks A++), winner of four stakes this year, and one of the fastest turf sprint fillies around, and two-time stakes winner COUNTRY DAY (TrueNicks A++) are, respectively, out of mares by Peaks and Valleys, and that horse’s sire Mt. 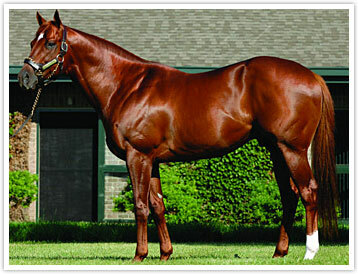 Livermore (and from only four starters by Speightstown out of Mt. Livermore line mares). We’ve mentioned Mt. Livermore’s sire Blushing Groom earlier as the sire of the granddam of Lord Shanakill. Peaks and Valleys, the broodmare sire of Rose Catherine, is out of a mare by Green Dancer, who is by Nijinsky II (genetic relative to Storm Bird, sire of Speightstown’s broodmare sire, Storm Cat). MOTHER RUTH (TrueNicks D), twice a stakes winner this year, is out of a mare by Colonial Affair (by Pleasant Colony). The key here may be not so much the cross with the Pleasant Colony line, but the pedigree of Colonial Affair’s dam, Snuggle. She is by Nijinsky II out of a Raise a Native mare, so is a reverse cross to Speightstown (Raise a Native/Storm Bird). SIMPLY SPITEFUL (TrueNicks A++) took the Foil Stakes at Aqueduct. She is out of a mare by Silver Charm (by Silver Buck, by Buckpasser, also the sire of the third dam of Speightstown). There are already two stakes winners by Gone West sons from 14 starters out of Silver Charm mares, both by sires carrying Buckpasser. ESSENCE HIT MAN (TrueNicks A++) captured a trio of stakes in Canada this term. He is out of a mare by El Prado (three Gone West line stakes winners from 23 starters out of mares by El Prado). El Prado is a Northern Dancer/Sir Gaylord cross, similar to the Northern Dancer/Secretariat (half brother to Sir Gaylord) cross that produced Storm Cat, the broodmare sire of Speightstown. CONGOR BAY (TrueNicks D), who took the San Pedro Stakes is out of a mare by Red Ransom (who has not been a great foil for Gone West). Of course, the dam, Pico Teneriffe, was a very good runner and an excellent producer, but what’s interesting here is that the second dam is a Mr. Prospector/Northern Dancer cross, a parallel to Speightstown. POSEIDON’S WARRIOR (TrueNicks B+), from Speightstown’s third crop, is a winner of the NATC Futurity and out of a mare by Smarten, from the Turn-to line. FUFTY TWO (TrueNicks A), a turf stakes winner from Speightstown’s first crop, is out of Cape North, a daughter of Capote and Champion Older Mare North Sider. Gone West/Seattle Slew in general has not been a particularly strong cross, but over Capote mares, Gone West and his sons have five stakes winners from 51 starters. THAT’S HOW I ROLL (TrueNicks A+), winner of the Maryland Filly Championship, is another out of a mare from the Northern Dancer line. Her dam is by Lost Soldier (by Danzig out of a Secretariat mare, and so bred on the same Northern Dancer/Secetariat cross as Storm Cat). The second dam is by Cure the Blues (granddam a three-parts-sister to Secretariat, who is three times in this pedigree), and the third dam by Linkage, who we already mentioned as broodmare sire of Mona de Momma.